IN ANCIENT TIMES, China was known as the Land of the Divine. Everyone, from emperors to the common people, believed that their culture was a gift from heaven. They lived in harmony with the universe and saw a connection among all things. Traditional Chinese culture carried these principles for thousands of years—until this world was lost. We now invite you to visit this lost civilization. To make this journey possible, we have pushed the boundaries of performing arts. We combine ancient legends with technological innovations, and historically authentic costumes with breathtaking animated backdrops. We let classical Chinese dance do the storytelling, and share with you beautifully diverse ethnic and folk traditions. Filled with an enchanting orchestral sound, this is a mesmerizing experience you won’t find anywhere else. 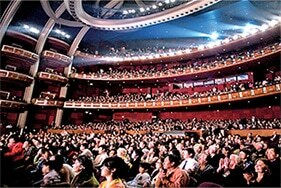 The authentic Chinese culture Shen Yun presents can’t be seen in another show or even in China. There, the Communist Party sees traditional culture as a threat to its power and for decades has tried to destroy it. It nearly succeeded. But in 2006, a group of elite Chinese artists came together in New York with a mission—to revive traditional culture and share it with the world. They created Shen Yun and brought this majestic culture back from the brink of extinction. Join us in this historical moment. It is an unforgettable journey! Some people fly from other countries or drive hundreds of miles to see it. Others see the same show five or six times. Why? Many say there are no words to describe it—you have to see it with your own eyes.